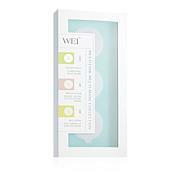 This mask is designed to help hydrate, sooth and illuminate the look of skin. Remove the mask from the protective tube with provided tweezers and gently unroll. Place onto clean, dry skin, smoothing the delicate fiber to fit the curves of the face, eyes, nose and mouth for proper placement. For maximum absorption, leave on for 10 minutes. Do not wash off. Press the remaining essence into skin. Ingredients: Oryza Sativa (Rice) Germ Extract, Aqua\Water, Butylene Glycol, Glycerin, Pentylene Glycol, Glycyrrhiza Uralensis (Chinese Licorice) Root Extract, Sodium Ascorbyl Phosphate, Phenoxyethanol, Tromethamine, Benzoic Acid, Sodium Metaphosphate, Acrylates/C10-30 Alkyl Acrylate Crosspolymer, Xanthan Gum, Disodium EDTA, Polysorbate 20. Saw an immediate difference after removing the mask and the next morning. Using the left over in the tube for the next week, like a serum, also gave great results. 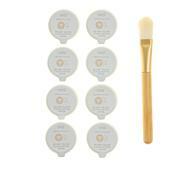 Hydrating and illuminating just as advertised. Absolutely Love The Hydration ! 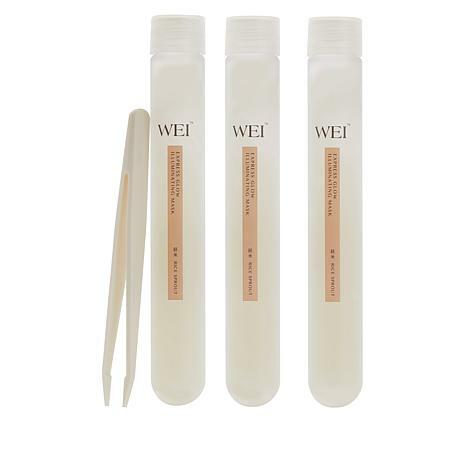 The Wei Rice Sprout Illuminating Mask is a wonderful treatment. I love how the tube holds all the serum. The mask itself is very comfortable and saturated. More than half of the tube is left with serum. I kept my mask on for 30 minutes and kept reapplying the serum to it. After I removed it, my face was so soft and supple. I continued to apply the serum, and didn't need any additional moisturizer. The serum was perfect just on its own. Highly recommend. What It Is This superfood mask is infused with pomegranate grains, glycolic acid, enzymes, white clay, willow bark extract and other key ingredients. It exfoliates in three distinct ways—mechanical, chemical and enzymatic—for the look of poreless, glowing and smoother skin. What You Get 2.